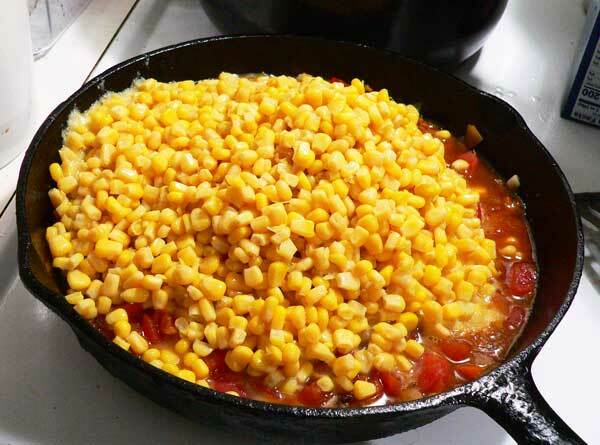 Easy to follow, step-by-step, photo illustrated recipe on how to make Corn Maque Choux. Printable recipe included. 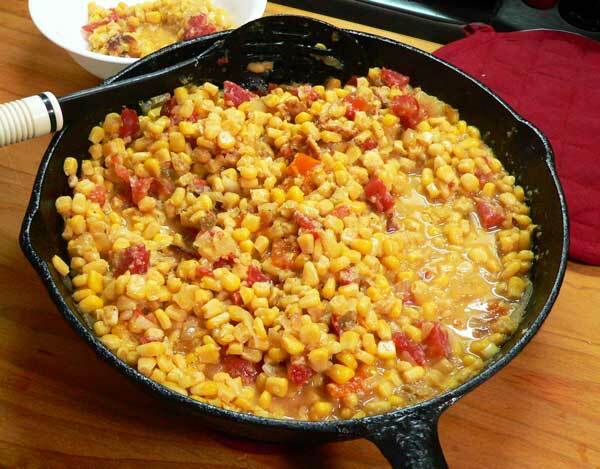 Creole Corn Maque Choux, easier to make than it is to pronounce. Smile. First of all, it’s pronounced Corn-Mock-Shu. It’s a traditional dish of southern Louisiana. Secondly, my mother never cooked this. Unlike most of the other recipes here on Taste of Southern, it wasn’t something she prepared for us. I’m sure she never knew anything about it. Of course, I didn’t either until a few weeks ago. My thanks to Kathleen Mc., a subscriber to our Newsletter, for sharing this recipe taken from the “Something To Talk About Cookbook” produced by the Junior League of Lafayette, Louisiana. Kathleen says Corn Maque Choux is a very popular side dish in south Louisiana where the folks don’t eat a lot of vegetables. Mostly meat and rice she says. Gator meat anyone? Smile. Kathleen likes to add sliced okra with the dish and says you can make it with the canned corn as we’ve done here, or with fresh corn if it’s available. I was also given the invitation to meet Kathleen and her family if I ever find myself down in Louisiana. Thank you for that Kathleen. I’d love to do that one day if possible. This dish turned out really well in my opinion. It was easy to prep and easy to cook. I can see where you could add some sausage perhaps, and turn it into a main course meal in itself rather than just as a side dish. 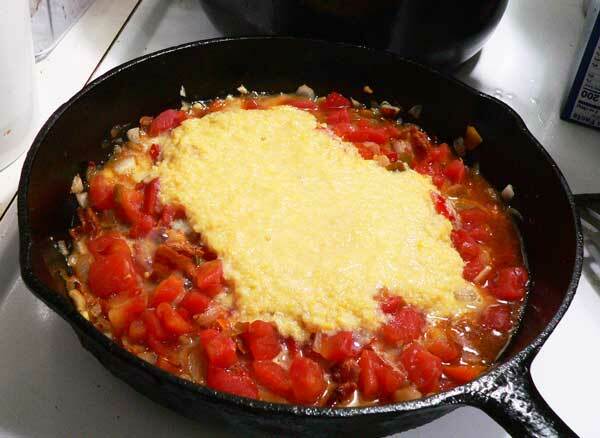 It was sweet from the corn, with a little Cajun kick from the chiles in the can of tomatoes. So, ready to give it a try. Alright then, let’s head on out to the kitchen, and… Let’s Get Cooking! 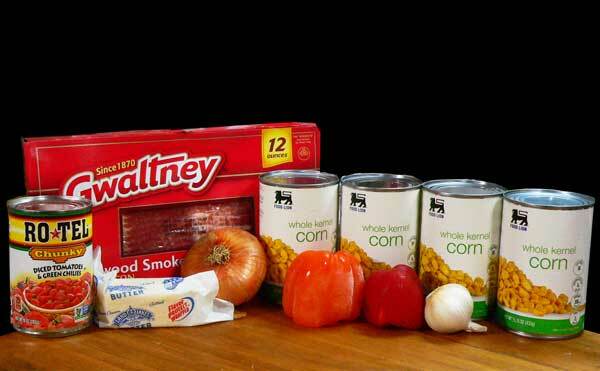 Corn Maque Choux Recipe – You’ll need these ingredients. We’re using canned corn here, but frozen corn could be used and fresh corn would be even better. Just make sure you use an equal amount as called for in the recipe. 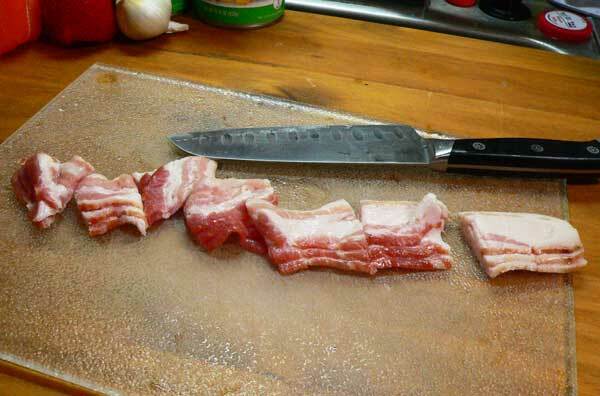 Cut the three slices of bacon into about one inch sections. 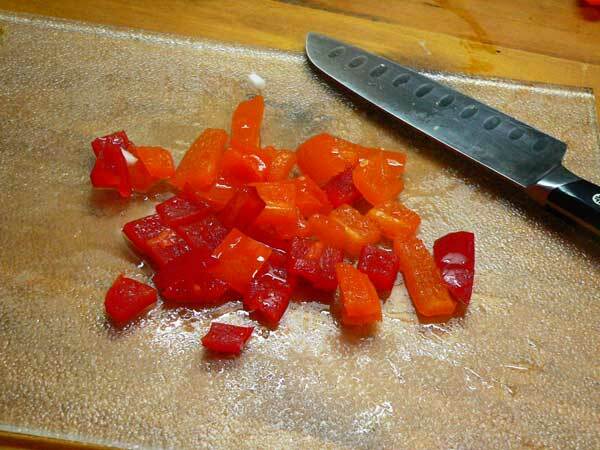 Cut or dice the bell peppers. Green bell peppers will help add some color to the finished dish. I only had a small red bell pepper and a small yellow one so that’s what I used. Finely chop the clove of garlic. I used two small cloves here. 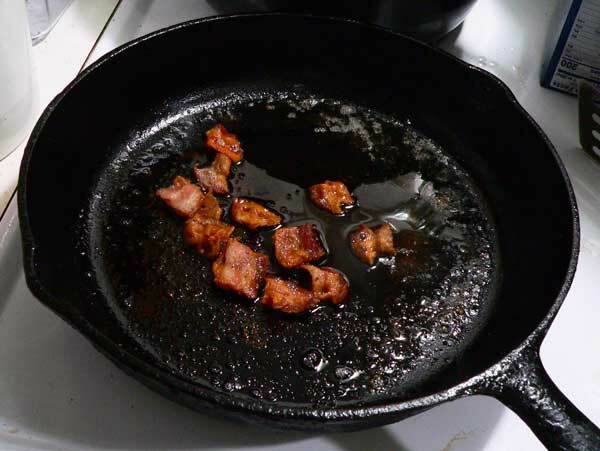 Place the bacon in a skillet and fry it until it’s crispy. Drain off the bacon grease, leaving just a small amount of the fat in the pan. 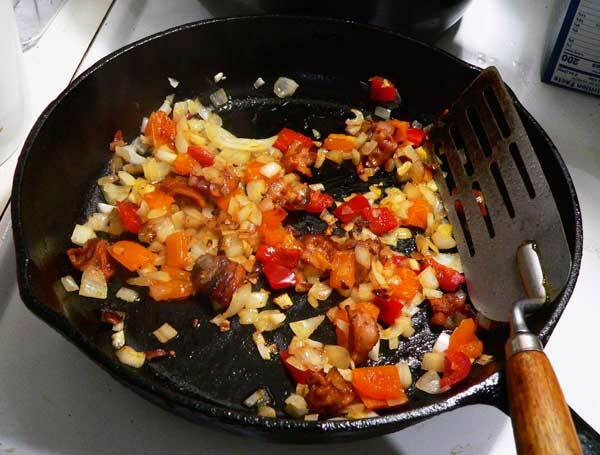 Add the onion, bell pepper and the garlic to the skillet. Stir and cook until the onions are tender. Add the can of tomatoes. Let these cook for about 2 minutes. Drain THREE of the cans of corn to remove the liquid. Discard the liquid. For the record: After struggling with my $8.00 manual can opener trying to open these five cans, I decided it was time for a new one. I thought I was paying a lot when I bought the 8.00 one, but I’ve gone all out and ordered an OXO Smooth Edge Can Opener. Still manual and just over $20.00. Smile. The fourth can of corn needs to go into a blender. I knew this was going to be messy, but I was pretty determined not to mess up the blender and have to wash it. Smile. Just call me lazy. I used my stick blender instead, and slowly inserted it into the can of corn. As you can see, it ran over a bit, but… it worked. Blend until creamy. 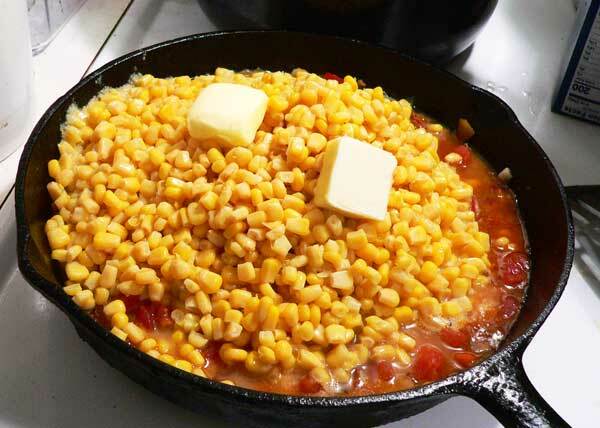 Add the can of corn from the blender into the skillet. Next, add the three cans of corn that have been drained. I’m using my 10 inch skillet and as you can see, it’s almost full. Add the two Tablespoons of butter. Stir everything together and let this mixture cook uncovered until it thickens. I let this cook for about 30 minutes, stirring it often during that time. Serve it straight from the skillet while it’s warm. 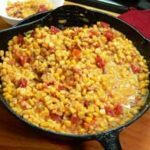 Easy to follow, step-by-step, photo illustrated recipe on how to make Corn Maque Choux as seen on Taste of Southern. Prep the vegetables: Chop the onions, chop the bell peppers, mince the garlic. Drain 3 cans of the corn. Set aside. Process the undrained can of corn in a blender until smooth. Set aside. 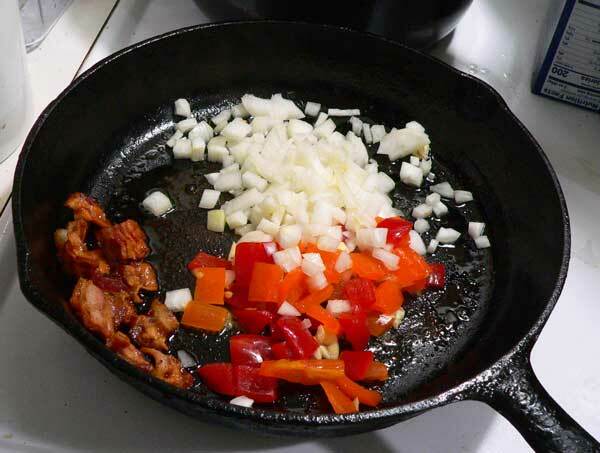 Place bacon in hot skillet and cook until crisp. Drain off excess drippings. Add the chopped bell pepper. 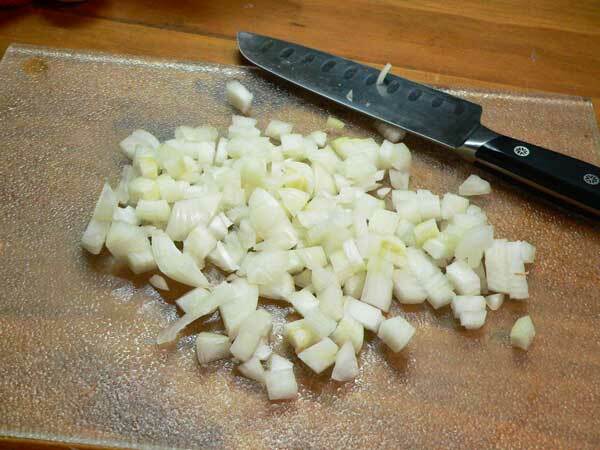 Stir often and sauté until onions are tender. 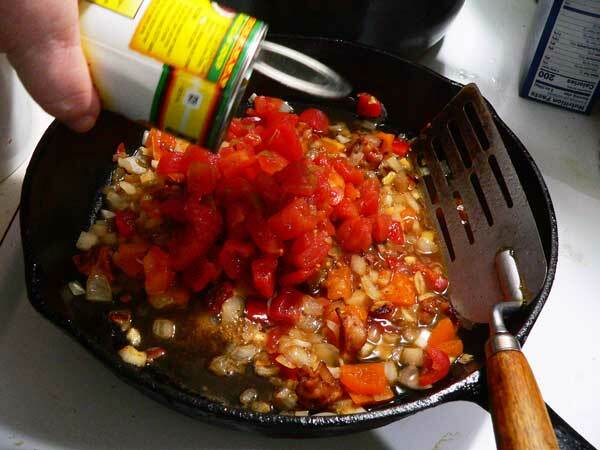 Add the can of tomatoes with green chilies. Cook for 2 minutes. Add the can of undrained corn. Add the butter. Stir well. 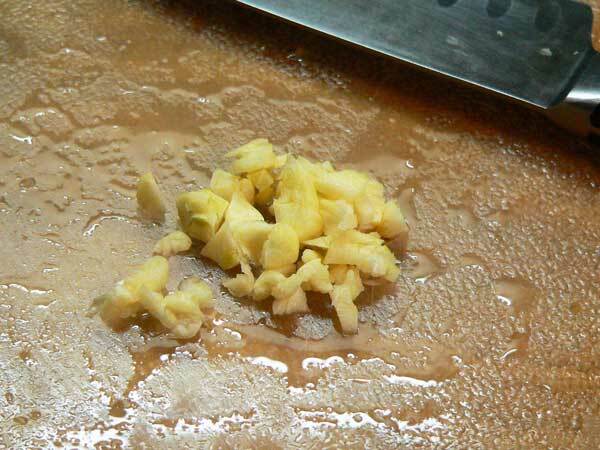 Cook over Medium heat, uncovered, until the mixture thickens, stirring frequently. 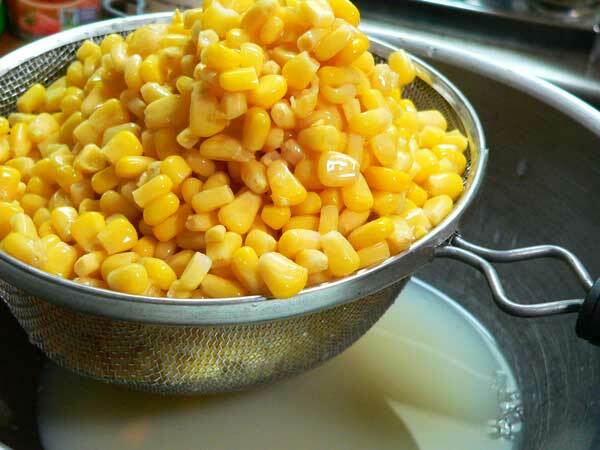 Frozen corn can be used instead of canned. Fresh corn would be even better if available. Try adding some sausage to the skillet after you’ve cooked the bacon to turn this into a full meal in a skillet instead of just a side dish. Lots of possibilities with this. Enjoy! 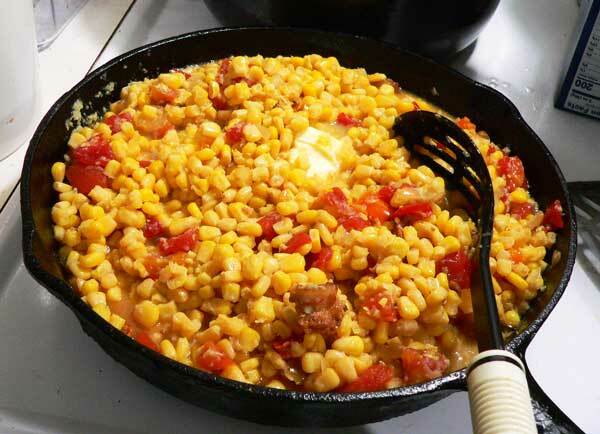 Have you ever tried this Creole Corn Maque Choux? Or, were you like me and had never heard of it? Mama didn’t make this when I was growing up, but it’s only because she didn’t know about it either. Smile. I’d love to know what you think about this special recipe. It will only take a minute or two for you to leave your comments in the section below. Seems like you could use a can of creamed corn in place of having to blend up that 4th can. Just saying. An old Native Indian recipe from Louisiana and Alabama(Creek Indian)area. Garden fresh corn(milked)and tomatoes, local shrimp, crab or cray/crawfish, but pretty scarce to find in the winter;). We use the Cajun “holy trinity” blend of green peppers, onion, and celery. To finish it off, a little cream or evaporated milk, a dash of Tabasco or cayenne for a little kick, and like your mother always said, Steve, a little sugar to make those veggies and tomatoes taste better. Sometimes a dusting of flour to thicken things up if needed. Smothered corn at its finest. Ronald Kerelegon family recipe for 5 generations. You are so right about the crab meat(and your clam chowder looks amazing), but alas, we don’t have easy and affordable access to fresh crab or clams, so most of the summertime, we make maque choux with no seafood, but the garden fresh corn and tomatoes are a meal in itself. Dear Steve, I’m so glad you tried out this recipe! I agree with you about adding some sausage to it. In Louisiana we’d probably use andouille sausage but that can sometimes overwhelm things. A milder sausage might work better. God bless you and thank you so much for your newsletter and recipes! Never have heard of this but will try as it looks delicious. Will have to add some type of meat for hubby. (smile) No problem printing. Hope you are able to get out and enjoy the beautiful colors of Fall. Enjoy your newsletter and recipes. Hi Steve, We received this recipe 50 years while camping in the Smokey Mts. from a couple from Louisiana. We make it mostly when the sweet corn is in season here Indiana. As Andy Griffith would say “IT’S GOOOOOOOOOOOOOD!!!!!!!!!!!!!!!! REALLY ENJOY YOUR WEB SITE! Get Well. This was fantastic! Now I will say I added Cajun seasoning to it and it had quite the kick! Also put turkey sausage in it. Hubby loved it! Will definitely make it again and have corn bread also! Thank you for the recipe! Yummy! I’ve never heard of this dish and I’m a southern girl. It’s on my to try list this week. I’m with Diana. 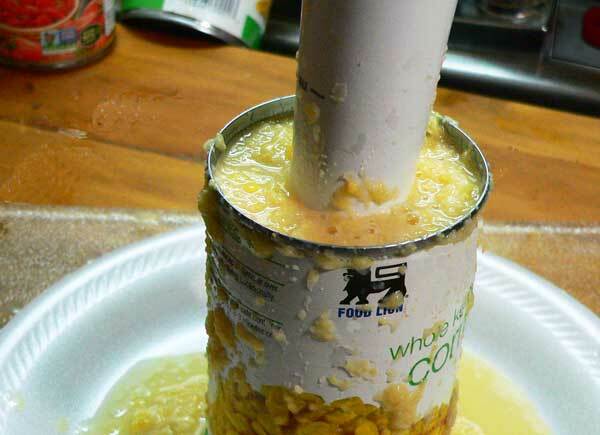 A can of cream corn would do the trick instead of blending a regular can of corn. By the way thanks for adding the Pin button. I have been wanting to do that with your recipes but it wasn’t available. Be well. Just wanted to let you know that the recipe printed out perfectly and no problem adding the recipe to my Pinterest recipes. This recipe appears to be something we would like so I’ll give it a try. I did see Emerille Lagasse make this on his TV show years ago. I was wondering what to cook tonight since I have a meeting, which always is at 6. This looks pretty fast and delicious! Can’t wait to make it. I think I will put some sausage in it, cause that sounds terrific! Will let you know! Make this with fresh corn cut off the cob, peppers, onion, add shrimp and cream at last minute. Tastes great. Love your column and the new website is so much easier to navigate. I’ve made a similar corn dish for years. I like Rotel and I love corn. Adding the bacon was new to me and really enhanced the taste. I used the bacon grease instead of butter for sautéing the veggies. Wishing you well and continue working on your recipes.